The new campaign has been created in partnership with creative agency, The Monkeys, and works by connecting a consumer’s email to their Instagram account. 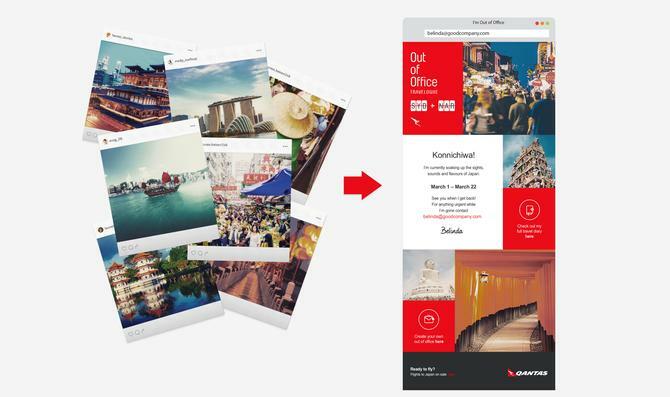 It then automatically pulls through any images uploaded to the social media side by the user with the hashtag #qantasoutofoffice and sends an email to those who’ve tried to contact the consumer with a collection of their holiday snaps. The use of the hashtag allows users to curate the pictures they want shared, both from public and private Instagram accounts, as well as include a quick message about their travels. The Qantas Out of Office Travelogue works on all Office 365 emails and all Gmail accounts, including other domains that use the Gmail inbox. “The traditional out-of-office message can be both generic and impersonal in nature and from our research, 60 per cent of employees say they appreciate receiving something more creative,” said Qantas Group executive brand, marketing and corporate affairs, Olivia Wirth. Instagram brand development lead for Australia and New Zealand, Sophie Blachford, also saw Qantas as an innovator in the aspirational travel space. “Qantas Out of Office Travelogue is a unique and clever platform for an airline because most people who are travelling will activate their out of office as their final gleeful gesture before jetting off,” she added. The ongoing campaign is open to any consumers and does not require Qantas loyalty program membership.